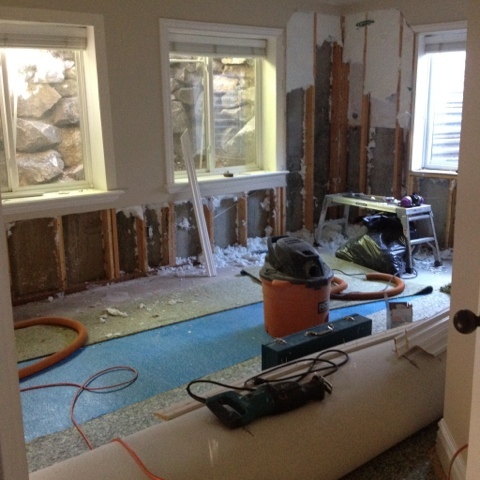 We recently moved into a home and later discovered there was mold behind the sheetrock in the basement. It has turned into quite the project and we have gone from people who didn't know squat about mold removal to almost experts on the subject. Our house was smelling horrible and it felt humid down in the basement, so hubby decided to pull back some carpet under a window and he discovered mold. With further investigation he discovered that the mold was growing behind the baseboards, behind the sheetrock, and on the insulation. It wasn't visible on the carpet pad but it had absorbed the smell so bad that it had to go. With the help of our handyman neighbor, hubby tackled the mold. I stayed upstairs so there are no pictures of the mold before it was ripped out. Trust me, it was bad! Multitool to cut the sheetrock evenly. This saves time when you have to put new sheetrock up. The mold wasn't too bad on the carpet so we pulled it back and saturated the backing with Shock Wave. I'm sure in some cases you will need to replace the carpet, so use your best judgement. Don't use bleach on the backing as it will soak through and ruin the carpet. The pad under our carpet was bad, so hubby went a couple feet beyond the damaged pad, cut off all the bad stuff, and threw it out. The only things that survived, was the carpet and the studs. 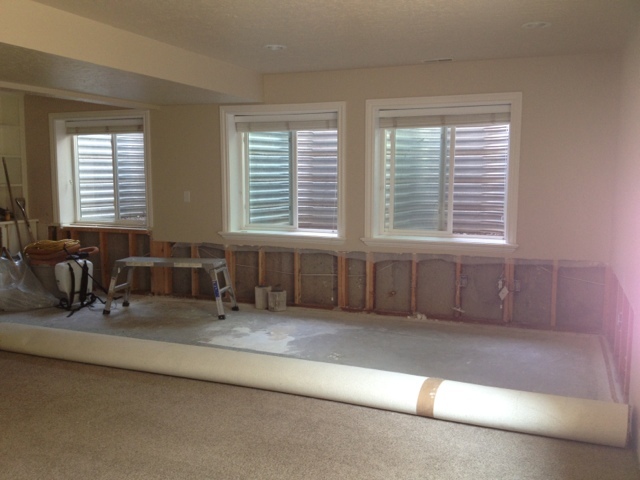 The carpet pad, sheetrock, insulation, and baseboards all had to go and all debris was either bagged up or vacuumed up. Everything was sprayed down heavily with the Shock Wave solution. Hubby thinks he will go back with bleach and spray the studs just to be double sure everything has been killed. Locate where the water is coming in and fix the problem. Unfortunately for us, we had two problems. The downspouts were clogged causing the rain gutter to overflow into the window wells, which was an easy fix. 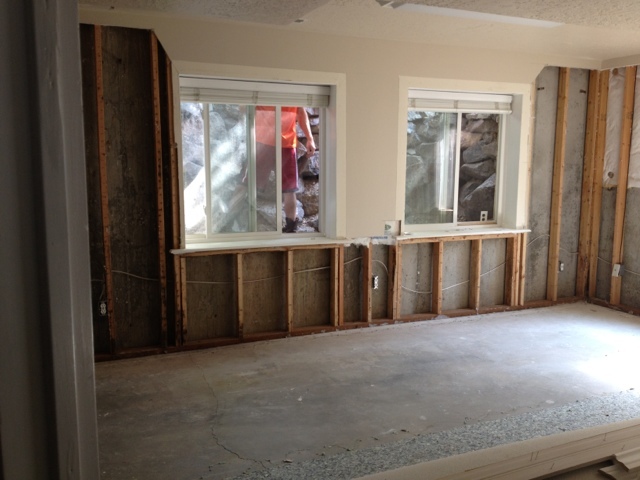 The other problem is that the exterior foundation wasn't completely waterproofed. This is not an easy fix as we have to excavate around the permitter of our home. There's lots of work in store for hubby, but at least he gets to drive a tractor. More pictures of the damage all cleaned up. The carpet in the laundry room was a total loss, which I'm ok with since tile will look so much better. 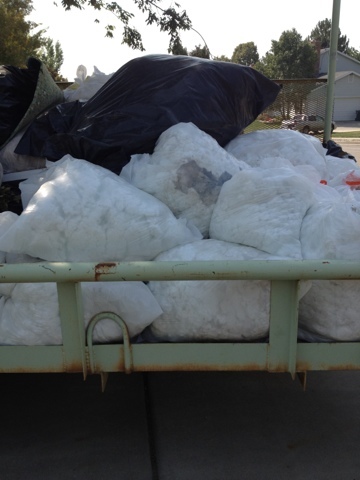 Here is our neighbor's trailer filled with bags full of moldy crap. Hubby didn't carry any garbage out through the upstairs; everything made an exit through the basement windows. 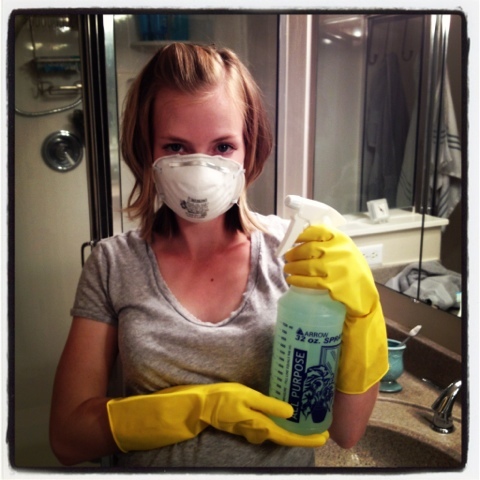 We disinfected our entire home to kill any mold spores that may have found their way upstairs. 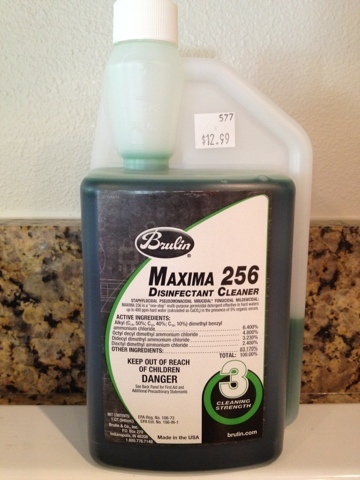 Here is the fabulous mold cleaning product, Maxima 256 Disinfectant Cleaner. We picked it up at our local janitorial supply store. This is a concentrate so you only need a half ounce per gallon of water. You should be able to get 64 gallons of cleaner from this one little bottle. The benefit of using this instead of bleach is that if there is a little bit of mold on your carpet, or if you fear there are mold spores on your carpet, you can saturate it in this stuff. We washed all of our walls with this and we didn't have to worry about the carpet getting bleached, or our clothes, furniture, or kid toys getting ruined. This stuff does a lot more than kill mold, people use it for everyday cleaning, including sanitizing kids toys. 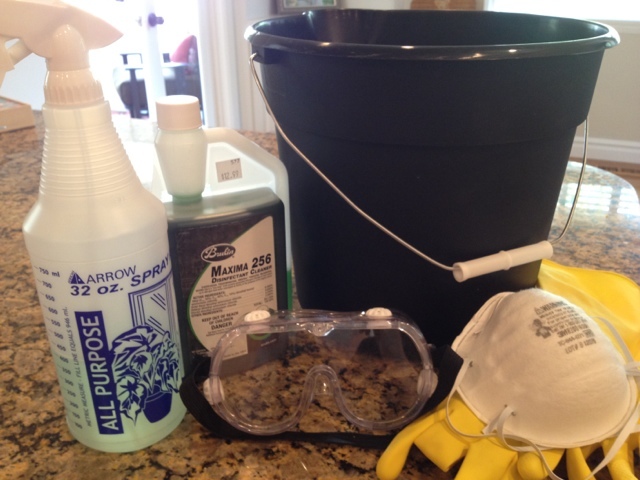 Just remember to be safe when cleaning mold or mold spores. Wear gloves and a face mask, even goggles. Spray it on any surface you think could have mold spores on it and wipe off with a rag or sponge. I just found your blog while googling lazyboy upholstering and I just love your site and cute personalities! I'm a new follower and excited to see your new projects. Wow- I'm so sorry you had to go through all that-it sounds like you cleaned it all up the right way, though. Those stories make me wish I was just renting! Good luck! 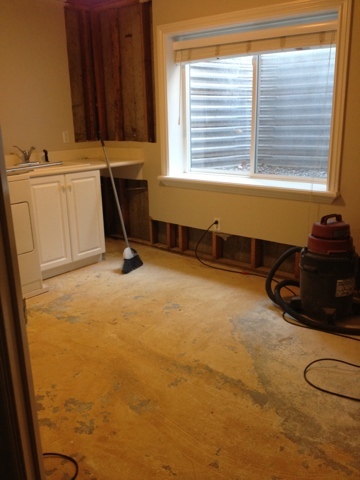 It is good if you plan to clean mold by yourself, wearing protective gear is advisable, normally it depends how much mold is present if it is too much hiring a removal company is better. Thanks for your safety tip, Steph. I've used bleach to clean my carpet in the past, but since I've become a mother, I resorted to using vinegar solution, tea tree oil and grapefruit extract. It's not as powerful as industrial cleaning solutions, but they still do well in keeping my carpets clean. Anyway, have you found out the cause of the mold?